The hatchback space has just been given another worthy contender in the form of the 2019 Maruti Suzuki WagonR. The only thing left to do then is to see how it stacks up against its closest competition. The new launch of the segment, the Maruti Suzuki WagonR, has been updated to accommodate more modern-day features and fresh styling. Coupled with a more powerful engine, the 2019 WagonR is indeed aimed at a much younger customer base. However, with worthy competitors from Hyundai, Tata and Datsun stables, it will be an uphill task for the WagonR to gain a respectable market share in the segment. Let's see how the 2019 WagonR compares against its chief rivals . . . The 2019 WagonR, despite having bigger proportions, owing to Maruti's Heartect platform, still doesn't offer class-leading length, as it falls short of the Tiago and the Go (the longest out of the four). However, the WagonR and Datsun Go both share a comparable wheelbase figure, which means that both cars have more or less the same legroom. However, headroom won't be a problem in the WagonR, for it is the tallest in the group, thanks to its 'Tallboy' design. While all four cars have similar width, it's the Go that offers the best ground clearance, thereby, making it the most speed-breaker friendly in the group. It should be noted, however, that official ground clearance figure of the WagonR is not yet available. For the first time, the WagonR gets multiple engine options, and this certainly helps the car in terms of its youth appeal. While the Santro and Go might seem underpowered in front of the Tiago, the WagonR puts up a good fight against the Tiago, as they both offer 80+ bhp from their respective 1.2-litre motors. In terms of driving refinement though, the WagonR stands beside the Santro, for only these two offer a 4-cylinder engine option. The Datsun Go faces a serious disadvantage in this comparison, for it is the only model on the list that lacks an AMT gearbox option on offer. This is where things get a little interesting. All four models here are more or less similar, for all of them offer two airbags (driver + front passenger), ABS, a touchscreen infotainment system and remote keyless entry. However, the Santro is the only model here that offers a rear parking camera – the other three only offer rear parking sensors – and rear AC vents, which is a segment-first feature. In terms of premium features, the Tiago and Go score higher, as they both offer alloy wheels, but it’s the Tiago that emerges as a clear winner overall, for it also offers projector headlamps and automatic climate control, albeit only in the top-spec ZX+ variant. 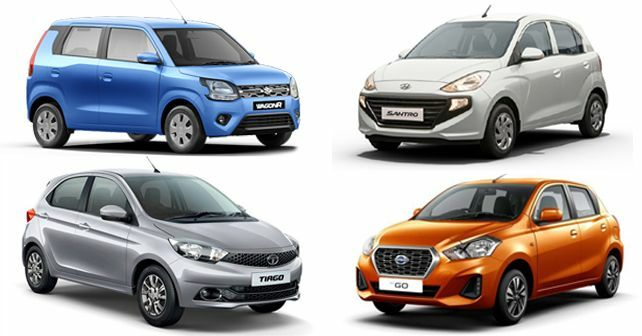 While the prices of Tiago and WagonR start beyond the ₹ 4 lakh mark, the Santro and the Go offer better value to first-time car buyers who are more likely to opt for a base variant. But for those who want a balanced blend of reasonable space, practicality and a premium feel, the Santro and WagonR seem to be good choices. However, for the enthusiastic buyer who would like to have good power, decent cabin space and a fair list of premium features, the Tiago offers the best value proposition.